There’s no point doing a course with us unless you then get to put those skills into practice – our relationships with Solent RIB Charter and Poole Boat Hire allow you to do just that! Whilst many people we train have their own boat there are plenty of others who are working towards a boat, still deciding on what to buy or perhaps keep a boat abroad and want to get afloat in the UK too. There are others that have a boat in the UK but want access to a different sort of boat or one where you can hand back the keys at the end of the session and not need to wash it, service it etc etc. There are never a shortage of reasons to hire/charter a boat and we hope to make that process easier for you. We give you two options. Poole Boat Hire used to be owned by us (and known as Purple Pelican Boat Hire) but is now owned and run by Esther who used to work with us. She runs 4 17ft Logic Marine dory type craft that are licenced for use within Poole Harbour. They are great little boats and allow you to put the skills you have learnt into practice. Visit the website – Poole Boat Hire to book or you can add a booking to a course booking by adding a hire to your ‘Shopping Cart’/’Marina Trolley’. 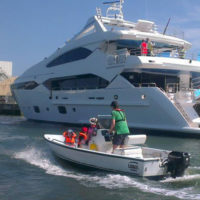 The second option is Solent RIB Charter who are based with us in Lymington. We’ve worked with SRC for over 10 years and have no hesitation in saying they provide the best charter RIBs in Europe and without doubt the UK. 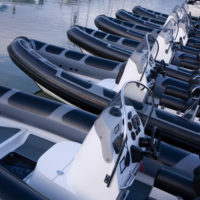 Their RIBs give you the chance to put the skills into practice in Lymington or, irrespective of where you have trained, getting out and going further afield. Again you can book through their website – Solent RIB Charter or add a booking to a course you are purchasing.